We’re crazy for kale at our household and love kale many different ways. My fave is using black kale in a salad with organic sundried tomatoes and lightly toasted pine nuts, maybe some sesame seeds and salt. I’ll add raw kale to my smoothies and we’ll sometimes just steam it plain as a side with dinner. I realize many find kale bitter and difficult to eat despite it being a superfood. Behold the mighty kale chip! This little guy can turn anyone into a believer. They are so yummy! I haven’t met anyone who hasn’t liked them. Our 4 year old and 20 month old gobble them up like candy, yes I said candy. 2. 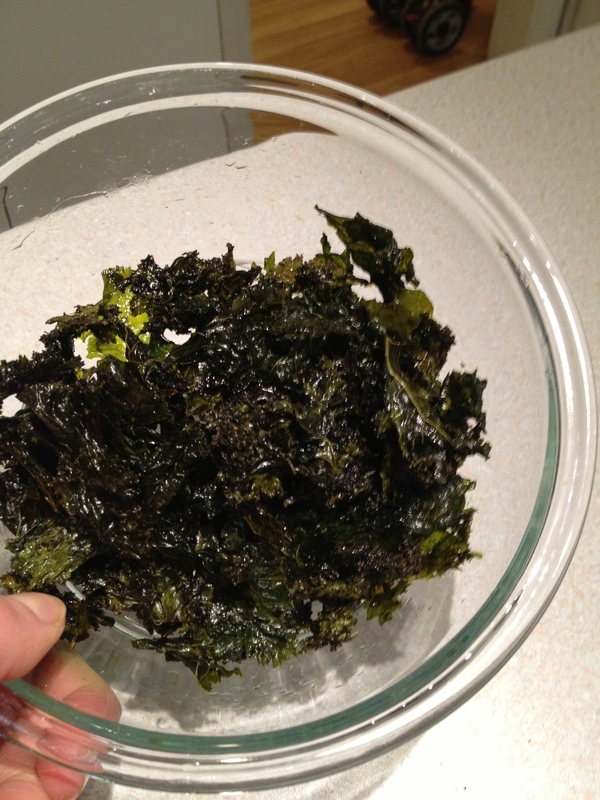 Tear the kale up into pieces (just rip it off the rib) – make sure the kale is dry! They won’t last long. Try it out and let me know what you think. Enjoy!